Blueberry Collides with Cheese in a Flavour Frenzy! Blue Cheese strains are world-famous for 3 things: extremely thick aromas, truly massive yields & whopping THC levels that easily exceed the 20% mark. Plus, the flavour is a mouthwatering combination of sweet Blueberry and creamy Cheese. Yum! For No-Fail Results, Always Go With Blue Cheese Strains! Everybody loves the unmistakeable UK Cheese taste and power, now it’s time to try the already famous Big Buddha Blue Cheese. An amazing electric blue with super fruity flavour, it still has the high-quality stink and astounding power of the original UK Cheese but with an added ripe blueberry taste and look – buy yours here! Combining the Best Parts of Blueberry & Cheese for an Unbeatable Combination! Blue Cheese is arguably the best example of hybrid perfection we've ever seen. This mix combines two legends, keeps the best traits of each, and somehow amplifies every feature in a synergistic fit of breeding genius! Think pungent Cheese aromas paired with big, round buds, Blueberry's lush flavours and truly satisfying yields. Blueberry-Dominant is the Best Pheno! Each Blue Cheese Cannabis Seed contains the genetic formula required to deliver a curiously strong end result thanks to a very generous power rating. In almost every case, independent testing has found that this hybrid serves up 20% THC at a minimum regardless of experience level. She's is a smart choice for any & all collectors! The best place to buy your Blue Cheese Seeds? Gorilla Seeds, of course! We have the most popular strains including award-winning varieties from Big Buddha Seeds and Barney's Farm in both photoperiod and autoflowering formats. Plus, our prices are the lowest on the net and we've got the fastest, friendliest customer service you'll find anywhere. Sold, yet? 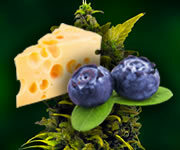 Buy Your Blue Cheese Seeds Now - No One's Got Better Deals! NB: The Internet is filled with Blue Cheese grows. Satisfy your curiosity there & keep your new pack of cannabis seeds safely dry & dormant for your own safety. Anything else is against the law in the UK & against the Gorilla Seeds TOS!